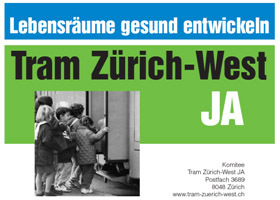 Last week's yes to the city's contribution of 59 million to Tram Zürich West isn't the last word on this matter. Opponents have succeeded in securing a cantonal referendum on the canton's contribution of 90 million for 25th November. Tram Zürich West is a project to build a new tram line from Escher-Wyss-Platz to Bhf. Altstetten. The 3km line costing 150 million Franks is scheduled to open in 2010.